But the title became ”In Stahlgewittern” – he claimed he got the word ”Stahlgewittern” from a skaldic song in the Icelandic saga literature he was reading at the time – more exactly he wrote 1968 that it was from Egil’s Saga, and later, in 1995, from “the Edda”. However, there appears to be no word ”Stahlgewittern” in any of the many German translations and various editions of Egil’s Saga or The Poetic Edda published before 1920. Besides these titles several other books on the subject were published in the late 19th and early 20th centuries, and words of this kind can be found in all of them. 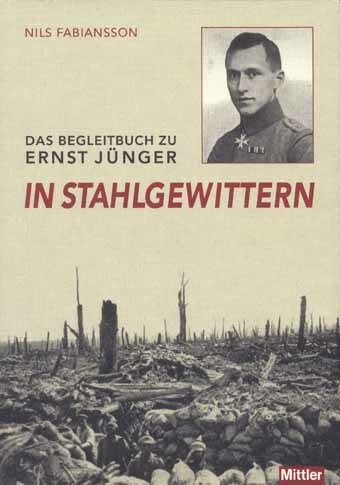 Thus it is impossible to know if Jünger had ever read the exact word ”Stahlgewittern” or if he actually got inspired by similar words. Considering that, it is nevertheless interesting, as Jünger actually mentioned Egil’s Saga as the source, to read the comment of a word in a poem in the LV chapter in Egil’s Saga in the 1894 translation by Finnur Jónsson: ”stáls-él, ’stahlsturm’ [”steel storm”], vgl. im folg. stála þruma = ’stahldonner’ [”steel thunder”] = kampf.”  In British translations the same Icelandic word in the poem have been translated into ”battle thunder” (1893) and ”thunder-crash of steel” (1930). Assailed mid snow of war. Starved not the ravens’ maw. From The Story of Egil Skallagrimsson, translated by Rev. W. C. Green, 1893. Read more in Nils Fabiansson, Das Begleitbuch zu Ernst Jünger in Stahlgewittern, p. 144–145. Julien Hervier, Entretiens avec Ernst Jünger, Arcades, no 9, Paris: Gallimard, 1986, p. 26. Ernst Jünger, Siebzig verweht I, Stuttgart: Klett-Cotta, 1980, p. 511; Ernst Jünger, Siebzig verweht V, Stuttgart: Klett-Cotta, 1997, p. 178. 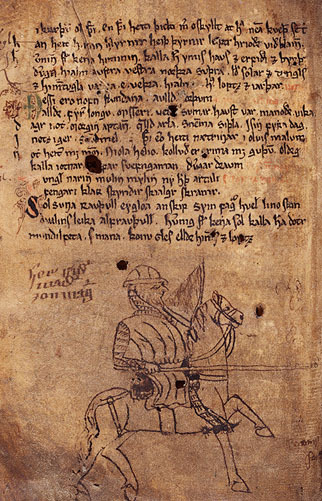 Egils Saga. Skallagrímssonar. Nebst den grösseren Gedichten Egils, Commented translation by Finnur Jónsson, Halle a. S.: Max Niemeyer, 1884, p. 159. In another song in Egil’s Saga some words were translated by Jónsson 1884 and by Felix Nieder 1911 into ”Waffensturm” (”weapon/arms storm”), and 1888 by Ferdinand Khull to ”Eisenregen” (”iron rain”). In Britain 1893 these became ”iron hailstorm”, and in 1930 “iron-storm”.